Ferries - LamaLo Technology Inc. 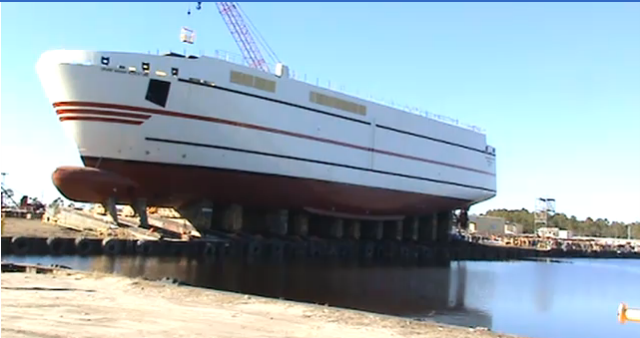 The MV Grand Mannan Adventure (GMA) was constructed by Eastern Shipbuilding Group Inc. of Panama City, Florida. The GMA has an overall length of 85.5 meters, a design draft of 4.52 meters, and a capacity of 80 cars and 10 Tractor Trailers, and can accommodate up to 380 passengers and crew. The vessel has a twin screw propulsion arrangement. Each of the four bladed controllable pitch propellers is driven by a diesel engine with a rating of 3000 HP at 900 RPM, through a single reduction gearbox. Each propulsion shaftline is approximately 26 m long, and is supported by a strut bearing, two sterntube bearings and one intermediate shaft bearing. The gearshaft is supported by two roller bearings. LamaLo Technology Inc. was contracted to ensure that the propulsion shafting system from the gearbox to the propeller had a satisfactory alignment when the vessel was waterborne and fully outfitted, for all modes of operation. The vessel went into service in 2011. 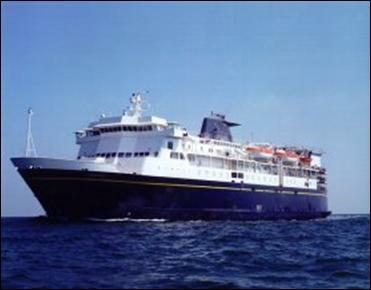 The MV Island Home, a 255' Double Ended Ferry, was constructed at VTHalter Marine Shipyard at Moss Point, Mississippi. The MV Island Home replaced the 200-foot MV Islander, which had been operating between Woods Hole and Martha’s Vineyard for the last half-century. The vessel has a double-ended twin screw propeller configuration. Each of the 5 bladed fixed pitch propellers is directly driven by a diesel engine with a rating of 3,000 HP at 900 RPM, through a single reduction reversible gearbox. Each of the two main engines is located near mid-ships and the corresponding gearbox is mid-way between the propeller and the main engines. The propulsion shaftline on the propeller side of the gearbox is 42' long, and is supported by a strut, a sterntube and a lineshaft bearing. The main gear shaft is supported by two spherical roller bearings. The propulsion shaftline forward of the gearbox is about 44' long and is a carbon-fiber type. LamaLo Technology Inc was contracted to ensure that the propulsion shafting system from the gearbox to the propeller had a satisfactory alignment when the vessel was waterborne and fully outfitted, for all modes of operation, and that the axial or lateral shaft vibrations were acceptable. The vessel went into service in March 2007. 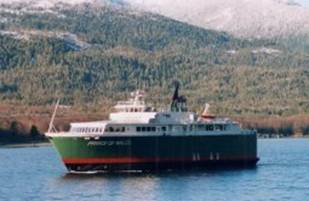 The MV Northern Adventure (NADV), formerly named MV Sonia, was purchased from in October 2006 to replace the sunken Queen of the North to operate the Inside Passage and Queen Charlotte Islands Route. The NAVD has an overall length of 117 meters, a gross tonnage of 9900, and a car capacity of 101 and can accommodate up to 600 passengers and crew. The service speed is 20.3 knots. The installed diesel propulsion power is 2 x 8,000 kW (16,000 kW / 21,400 HP). Vibration and alignment investigations were conducted. 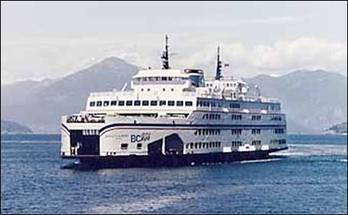 The MV Queen of Alberni is one of five “C” class ferries operated by British Columbia Ferry Services Inc. The vessels have a 457 ft. length overall, and a capacity of 295 cars and 1,170 passengers, and have a double-ended twin screw propeller configuration. Each of the 4 bladed controllable pitch propellers are driven by two diesel engines each rated at 5,930 HP at 425 RPM, through single reduction gearboxes. The gearboxes are connected via quill shafts that are concentric with the pinion shafts. The pinion shafts are engaged via clutches at the end of each of the quill shafts. This arrangement enables one or both of the diesel engines to drive either one or both of the propellers. An investigation was undertaken to determine the root cause of continued propulsion component failures (including the main gear) and to provide recommendations to prevent further failures. The investigation included a review of the failures, assessment of the system design and operations, theoretical modeling of the alignment condition, and measurements of the alignment condition. The cause of failure was determined and recommendations for realignment and design/operational changes were provided. 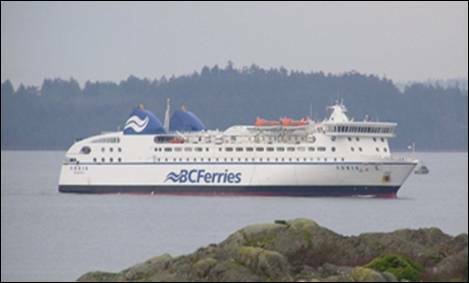 Realignment of the MV Queen of Alberni shaftlines was conducted in 2002. The alignment performance has since been acceptable, and maintenance costs have reduced significantly. After the successful re-alignment of the MV Queen of Alberni described above, the propulsion shaft alignment of the other four (4) “C” class ferries were measured and assessed. Three of the four ferries required shaft re-alignment. Since the realignment the shafting systems have preformed well and maintenance costs have been reduced significantly. The results of this work were presented at the SNAME 2003 Propellers/Shafting Symposium in Virginia Beach, Virginia, USA. 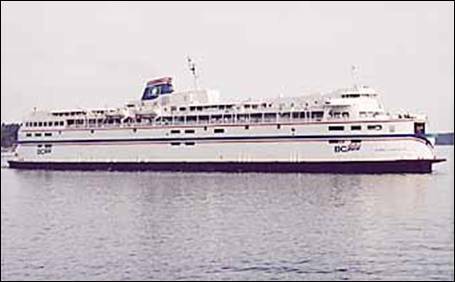 The MV Queen of Vancouver was built in 1962 in Vancouver. The vessel has a service speed of 18.5 knots, is 427 ft. long, and has a gross tonnage of 9,400. It has a capacity of 338 cars and 1,708 passengers and crew. The propulsion system is single-ended. Each of the two controllable pitch propellers is directly driven by a 4530 HP diesel engine through a double reduction gearbox. Each propulsion shaftline is approximately 88 ft. long, and is supported by two water lubricated strut bearings, a water lubricated sterntube bearing and two roller element lineshaft bearings. Each gear shaft is supported by two white metal oil lubricated journal bearings. The gearbox is arranged such that an intermediate shaft, with a pinion on each end, drives the forward and aft bull gears. This arrangement enables the input and output shafts of the gearbox to be in-line. The input shaft between the gearbox and main engine, which holds the flexible coupling, is supported by a roller element bearing. In March 2004 the aft bearing on the starboard gearbox intermediate shaft failed in service. Two other subsequent bearing damages occurred, each shortly after replacement of the previous bearing. After the third bearing was damaged, LamaLo Technology Inc. was contracted to determine if the shafting system alignment characteristics were acceptable, assist in determining the source(s) of the bearing failures, and provide recommendations to prevent further failures and realignment if required. This was accomplished by a combination of theoretical modeling, design review and assessment, and on-site measurements and observations. A finite element alignment model of the shaftline from the propeller to the forward end of the output gear shaft was developed and used in the analysis. 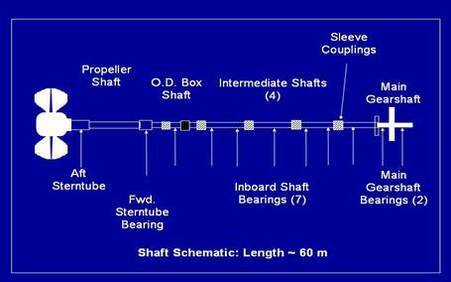 Strain gauge alignment measurements were taken on both the port and starboard propeller shafting. Jack-up load tests were conducted on the 1st bearing aft of the gearbox and the support bearing on the shaft between the engine and gearbox. It was concluded that the initial failure (and likely subsequent failures) of the aft bearing on the gearbox intermediate shaft, was probably due to a combination of misalignment of the gearbox output shaft with the propeller shafting and shaft vibrations as a result of this misalignment. Bearing dimensions may have been out of tolerance in some failures, which could have been a contributing factor. A realignment of the starboard shaft was conducted. The vessel was returned to service without any further failures. The MV Kennicott, a 380' Ocean Class Ro-Ro Passenger Vessel, has a twin screw propeller configuration, each rated at 6,593 HP (4,920 kW). LamaLo Technology was contracted to perform the alignment measurement and analysis requirements for construction and delivery of the vessel. This included the development of alignment criteria, a theoretical alignment analysis of the shaftline, measurement of the installed alignment condition using the strain gauge technique, and assessment of the installed alignment condition. Any discrepancies were identified, and remedial action proposed. Shaft alignment installation procedures were also produced. The vessel was delivered in the spring of 1998 and the alignment and vibration performance of the propulsion shaftline have been acceptable. The MV Joseph and Clara Smallwood is a passenger/car ferry that operates between North Sydney, Nova Scotia and Port aux Basques, Canada. The vessel is 27600 gross tons and 179 m long with a beam of 25 m and a draft of 6.75 m. An investigation was undertaken to determine the root cause of continued lineshaft bearing failures and to provide recommendations to prevent further failures. The investigation included a review of the failures, assessment of the bearing design, theoretical modeling of the alignment condition, and measurements of the alignment condition. 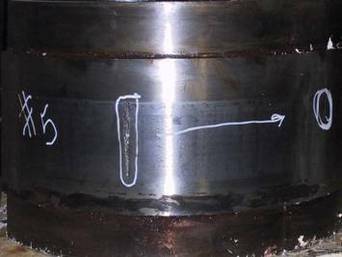 It was determined that the lineshaft bearing load capacity was marginal and that the shafting was misaligned to the gearbox. A complete realignment of both shaftlines was conducted in March-April 2003 when repairs were required to a main engine. 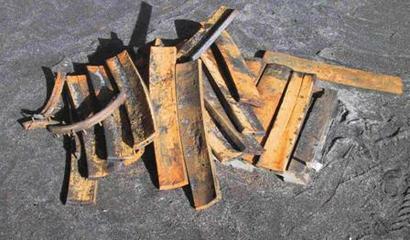 However, lineshaft bearing failures (wiping) continued to occur, with an indication of over-loading. A pressurized oil lubrication system was installed to increase the bearing load capacity. The performance of the bearings has since reported to be acceptable. Shaft alignment and vibration analysis and measurements during construction and delivery. LLT was responsible for ensuring the shafting system was aligned properly. This involved conducting a theoretical analysis, determining alignment criteria, producing shafting installation procedures, and measuring the installed alignment condition. The vessel was delivered in the winter of 2001, and the propulsion system performance has been reported to be good. A second vessel is under construction for delivery in 2006. LamaLo Technology Inc. is contracted for the shaft alignment, similar to the 1st vessel.